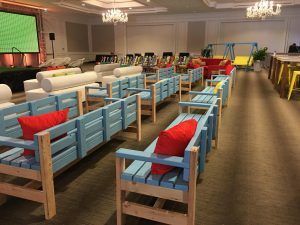 Comfy seating, clean lines, and fresh designs are topping the trends in event furniture rentals next season! 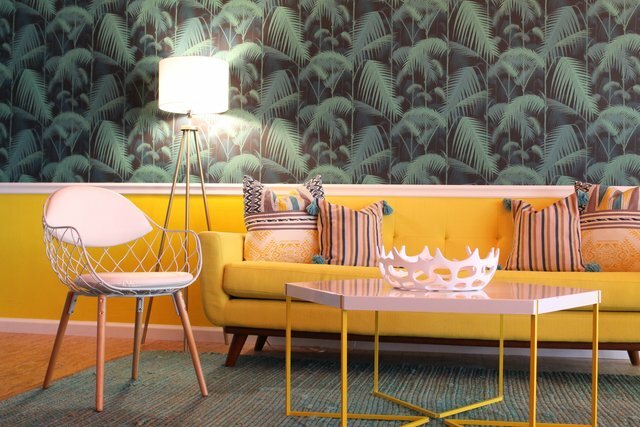 Here’s your rundown of our favorite furniture rental trends of 2019. If you dread being stuck in a hard, plastic chair during all-day events, you’ll appreciate this upcoming corporate furniture rental trend! In 2019, expect a strong focus on comfortable furnishing that’s created specifically for meeting environments. Why the focus on comfort? By providing a cozy and inviting space that people actually want to be in, then they tend to linger longer. That increased time spent mingling leads to–you guessed it–increased connections! We’re jazzed that the age of uncomfortable office-type chairs seems to be coming to a close. And, look forward to implementing more cozy seating that puts attendees at ease, promoting engagement and learning. One of our favorite seating styles that are available for your next event is our black wool Arne Swivel Chair (also available in red or grey faux leather). For those big on comfort, there’s also the super-luxe Big Squeeze. What If You Need to Seat an Entire Audience? Comfortable, supportive chairs are simple enough to source for a small crowd. But, how do you design an entire conference space that keeps attendees in their seats (and happy about it)? No matter the size of your audience, FW Rental Haus has got you covered. The telltale clean lines with curved angles and contours of Danish and mid-century modern furnishings continue to enjoy popularity for event furniture rentals across industries. These chic, versatile, and attractive styles hit a sweet spot. Both creating a sense of familiarity, while reflecting a hip, modern vibe—a must for any event targeting the millennial crowd. Examples include our best seller, the Hyland Sofa, the Palermo Sofa (also available in blue), and the dramatic (and hot pink!) Benson Chair. Check out additional styles in on our Mid-Century Collection page! 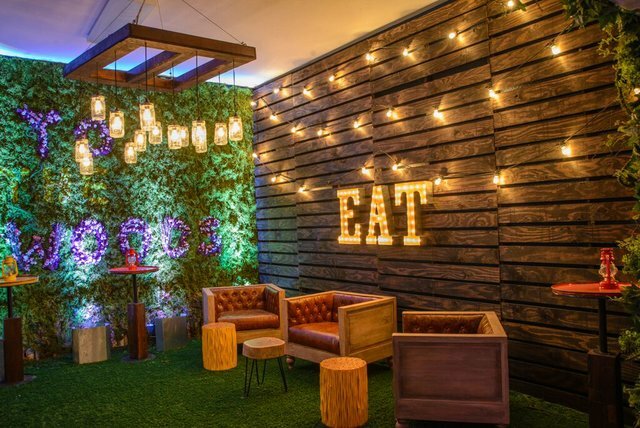 From living walls overflowing with flora to hanging garden chandeliers, bringing the outdoors inside is our favorite way to keep an event fresh. Even selecting just a few elements of greenery, such as a boxwood hedge or living wall, is a great way to create a warmer, more inviting environment. Potted plants or entire arches can also be used to divide space into comfortable nooks without feeling claustrophobic. The resulting backdrop is much better than drapery alone. Want to add some visual interest? 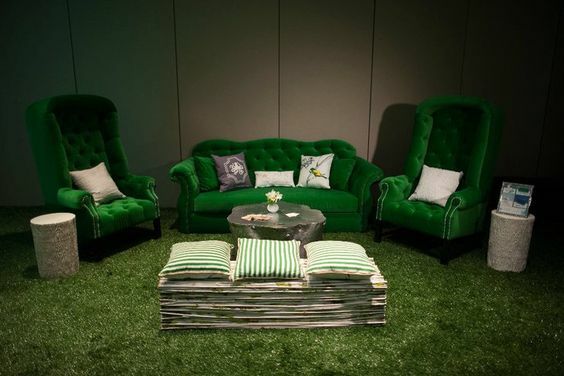 Using greenery as a cornerstone of your event decor means you can play with outdoorsy elements that perfectly complement our first trend of comfy seating, to create a cozy, cabin feel. You can find plenty of outdoorsy furniture on our Cozy Nights Collection page, which features styles like the Timber Chair, Cabin Fever Bar, and the ever-popular Kevin. Are you looking for an event furniture rental showroom in las vegas? Schedule an appointment to come by our W. Diablo Drive office by calling (702) 982-8102, or schedule a consultation on our Contact Page.